Home > News > Serious Cyber Attacks coming From The U.S.
Serious Cyber Attacks coming From The U.S.
Security threats and cyber attacks have become a matter of serious concern worldwide and looking at the global scenario China was pointed out to be the den for most of the hackers followed by Russia. But according to a survey conducted it was found that majority of the threats come from the United States itself. Researches are being conducted to find out the root cause of such attacks on critical infrastructure which consists of public utilities such as the power grids, water system and others. The experiment which was conducted to find out from where the attacks were coming from is simple. A decoy machine which is also known as honey pot was set up and it resembled an industrial control machine. It was made to look in such a way that the fake control systems were located all around the world in the US, UK, Brazil, Japan, Singapore and Netherlands and it was left as it is for a period of three months. The machine was attacked over 6000 times by computers located in the States itself. This number was followed by China with 3500 attacks and down in the line was Russia with a count of 2500 attacks. 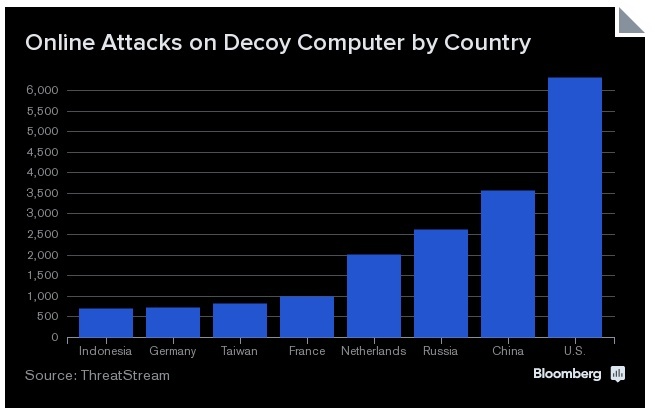 This shows that attacks from the US was equal to the combined attacks of Russia and China. How many were spoofed? or could they actually tell. It’s hard to tell or may be they don’t want us to know it purposely.